High-profile visibility solutions that can lower your operating costs by reducing the chance of rear-end collisions. 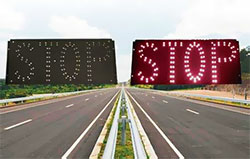 Fiberdyne Energy's U-STOP LED stop sign is just one of our custom LED signage solutions. 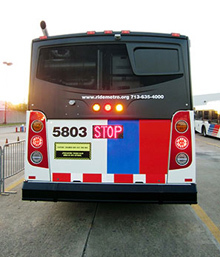 The U-STOP 300-series is wired to the vehicle's brake light circuit and illuminates the word "STOP" in bright red LEDs whenever the vehicle brakes are applied. The sign is fully potted, allowing it to be mounted in a wide variety of locations on your vehicle. 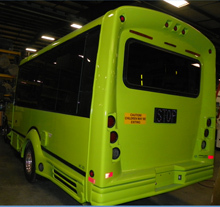 The circuit board is encased in a silicone based product providing moisture and vibration resistance for long term durability in a transit vehicle operating environment. We understand that buses operate in harsh environments - so we designed our U-STOP LED stop sign to operate in those environments. Our design was tested to confirm our U-STOP LED stop sign remains operational while fully submerged underwater, as per IP67.